Seaport Residences soars 60 stories above the waterfront in the Seaport District of Lower Manhattan offering unobstructed river and city skyline views from nearly each of the 98 light-filled residences. The elegant, all-glass tower is the first condominium project in the most historic neighborhood in the city. Hill West designed a building that embodies the essence of living on the water by day or by night. The designers digitized images of light on water to create a pattern by which the 4 types of glass on the building exterior mimic the sparkle and drama of the water and reflect the sky. Building infrastructure is located out of flood danger and off the ground floor. The main lobby, reached by a dramatic staircase, is also located on the 2nd floor. Incredible amenities include a pool with an infinity edge up against the glass that merges into the panoramic views of the city beyond. Balconies spiral up the building in a helix-like movement, drawing the eye from the base to building crown. By night, Seaport Residences illuminates the skyline with long baguettes of lights wrapping its crown like a modern residential lighthouse in the city port. Sky, 605 West 42nd Street, boasts an impressive 1175 units in a 60-story luxury rental tower. The approach to this building by foot or by car is through a cobbled entry court featuring a fountain holding a sculpture by artist Yayoi Kusama. The entry canopy is illuminated with an array of Hollywood bulbs that enhance the feeling of arriving at the foot of a red carpet. The soaring form of the tower is an exclamation point at the west end of 42nd street. The glass skin was designed to seamlessly marry exterior and interior, allowing for floor to ceiling glass in residential units and spectacular city and river views throughout. While the building is a single volume, the form is articulated as two slender rectangles slipped past each other, giving a verticality and slenderness that belies the nearly 1,000,000 square feet contained within. Each face of the tower is differentiated by subtle shifts of glass color and metal trim. At night, the building’s edges glow with thin bands of white light that culminate in the illuminated crown and the night sky. Many units on the western side have balconies with all glass railing panels that allow unobstructed view of the river and surrounding city. The building’s extraordinary amenity package includes NY City’s first Lifetime Athletic; a health and wellness club that is open to public membership and has a separate entry. It houses a full sized basketball court, Turkish bath, two outdoor pools, an indoor pool, and over 16,000 square feet of outdoor wellness space. 365 Bond Street sits on the Gowanus Canal at the edge of historic Carroll Gardens. The project is the first major development in Gowanus, an edgy industrial neighborhood that is quickly becoming a destination. 365 Bond is the first of a pair of buildings with 363 Bond, presently in construction across First Street. Designed as a complimentary pair, each building stands alone but shares a commonality of form and materials. The facades relate and both buildings look and acts like a series of buildings working in tandem to create a well-balanced neighborhood. The buildings both front a richly landscaped public esplanade designed by Brooklyn landscape architect Lee Weintraub and are adjacent to the historic Carroll Street Bridge. At 365 Bond, weathered brick, raw concrete and large expanses of mullioned glass make reference to the area’s industrial past. Although the building occupies an entire block its variety of scale and height make it feel like a neighborhood rather than a building. The units are anything but identical in this building, with over 66 unique layouts. There are duplex townhouse units with entries off the street that are surrounded by front gardens much like other townhouses in the neighborhood. Many units have private roof terraces and those that don’t can enjoy one of many outdoor amenities or a view into the serene inner courtyard from the floor to ceiling industrial windows. Amenities include a living lobby and community center, several lounges, a fitness center, valet parking, roof decks and community spaces for kayak storage and a boat launch. The neighborhood surrounding the 1.8 mile Gowanus Canal is in the midst of a renaissance. “The project challenged us to find a sweet spot between edgy industrial and Brooklyn brownstone. We managed that by weaving some common materials through a varied landscape of height and scale,” states David West. Rising to 22 stories with 78 condominium units, 1399 Park Avenue emerges as a beacon alongside the Park Avenue Railroad viaduct in East Harlem. The sculptural form is composed of architectural concrete, metal and glass. The building rises through a “Mondrian-like” composition of interlocking cubes and volumes. The building is a true expression of New York City urban design traditions, merging zoning, function and aesthetics into a singular sculptural form. David West, the project’s lead designer and premiere NYC zoning expert was the perfect counterpart to a client who encouraged excellence beyond the typical hurdles. Despite its height and size, the building has the ambiance of a boutique residence. The scale of the lobby and the amenities provide all that a resident could hope for without sacrificing a feeling of intimacy. An integral part of the 5th floor amenity space is a lounge that spills out onto a terrace and seamlessly blends interior and exterior space. Even the furniture defies boundaries as the bar/table/grill element penetrates the glass between the lounge and the terrace. The site’s zoning challenges led to some unique moves that helped to shape the form while also still allowing for function. The building resembles a series of nested cubes suspended from a solid vertical spine. The mass was first informed by zoning needs but then took sculptural form with deliberate manipulation by the designers. A cube hovers above other forms as the central shape around which other forms wrap. Large exposed columns and a recessed amenity terrace at the 5th floor augment the impression of a hovering cube separated from other forms by voids all around. Glass surfaces increase as the building rises to allow for views. Private terraces wrap the building at multiple levels and capture spectacular views of a vibrant neighborhood including such hidden gems as the community garden to the south. Hill West created a landmark in the Harlem skyline by combining function and aesthetic in a tower that Harlem can be proud of. 234E23 is a 20-story condominium building with 57 units located in the Gramercy neighborhood. Hill West created a contextual brick building reminiscent of a historic Soho-style warehouse with a contemporary twist. The tower maximizes views of Gramercy Park with large, mullioned windows that are nearly floor-to-ceiling. The selected brick is eroded and aged to feel as though it has been part this neighborhood for years. Metal fins rise up the building from an elegant chiseled and scored stone base to the top of the tower, emphasizing the building’s verticality. The fins frame window openings to make the windows feel as though they are part of a deep masonry wall; the hallmark of a quality historic structure. These same fins continue, uninterrupted to form the parapet railing of the amenity roof terrace, a thoughtful detail that adds to the slender quality of the tower. There are only five units per floor on lower levels, two units per floor on upper levels and a duplex penthouse with direct elevator access. Private terraces allow for city and park views from the gracious units, many of which have double exposures in living rooms and windowed kitchens. The building features amenity spaces such as a state of the art fitness center and two roof top amenity terraces. The inspiration may have been born in the warehouse aesthetic but the execution is one of refined luxury in Gramercy Park. 101 Lincoln Avenue is a mixed-use market-rate residential building occupying an entire city block at the foot of the Third Avenue Bridge. On the Harlem River, the site has historically served as a freight transfer depot for rail, boats, and trucks. The property has 500′ of waterfront frontage and will feature a 25,500 square feet waterfront public access area. The building will integrate its surroundings with multiple entry points: a residential entry courtyard from Lincoln Avenue for pedestrians and vehicles, a residential lobby entrance at Bruckner near Third, and retail access from all four corners. The building composition consists of three stand-alone 24-story towers and one 22-story tower, growing out of a 6-and 7-story podium. The entire structure, constructed of reinforced cast-in-place concrete, sits on a common cellar. At the center is a landscaped entry courtyard open to Lincoln Avenue and set two feet above the 100-year flood plain. The courtyard gives access to the two lobbies, each serving two towers, and an entrance to the multi-level parking garage. 2401 Third Avenue is a mixed-use market-rate residential building on the former JL Mott Iron Works site at the foot of the Third Avenue Bridge. On the Harlem River, the property has approximately 350′ of waterfront frontage which will be accessible to the public. The building has pedestrian access from Third Avenue and vehicular access from Bruckner Boulevard via a dedicated drive under the bridge. The building consists of 430 rental units with indoor and outdoor amenities, 175 mostly-indoor attendant parking spaces, and a community facility. The entire project has a total above-and-below grade area of 459,474 gross square feet. The building composition consists of one stand-alone 25-story tower and two other towers, a 25-story and a 16-story, growing out of an 8-story podium. The entire structure, constructed of reinforced cast-in-place concrete, sits on a common cellar. The roof of the cellar podium, in those areas which surround the towers, is landscaped and set two feet above the 100-year flood plain. This landscaped deck, open on one side to the river and waterfront esplanade, serves as an entry court and drop-off to both lobbies. At Reade Chambers, Hill West won approval from the Landmarks Preservation Commission for this modern take on a classic Tribeca building. 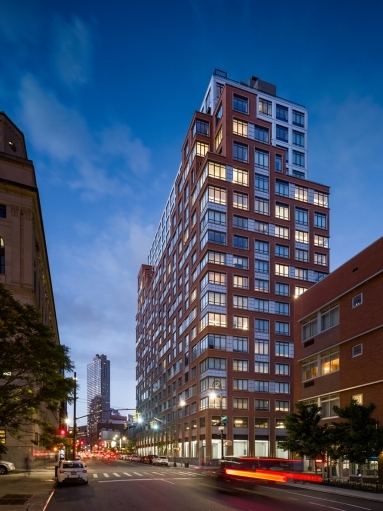 The mid-block 18-unit condominium building spans through from Reade to Chambers street and looks to the surrounding neighborhood for scale and context while adding contemporary fresh touches. The residential entrance on Reade Street sits in a black metal base made of refurbished cast iron columns salvaged from the previous building on the site. The garage door mimics a historic wooden carriage door, and the creamy Jerusalem limestone used above the base gleams resembles the Tacohoe marble that was often found on 19th century Tribeca facades. Historic details mix with modern ones. Forged metal Juliette balconies on Reade Street look to the past while a modern cornice signals a contemporary style. Large scale windows are framed with thick stone slabs and a reveal to set off the frame from the rest of building. The way the window bays alternate from single punched openings to double windows separated by fluted stone pillars sets the building in the contemporary era. The building features a number of amenities that include a central courtyard, rooftop terrace and an indoor fitness center. 22 Central Park South is a landmarked condominium building containing 6 full-floor residences and a duplex penthouse. Hill West won approval from the Landmarks Preservation Commission to renovate the small building attached to the Plaza Hotel. From a non-descript building with exterior fire escapes, a subway entrance in the base, and numerous challenges, Hill West created a jewel –like residential condominium that draws from historic details in the surrounding context without overshadowing the historic Plaza next door. A penthouse and balcony, setback above a cornice line, are designed at the top of the building taking full advantage of proximity to Central Park without being visible from the street. Limestone is carried into the subway and the public entry is integrated into the building base with a glass and metal frieze above the entry that marries with the decorative residential entry canopy. The ornate metalwork in the Juliette balconies and the prominent stone sills are drawn from contextual historic details, while the large windows sit in recessed frames far more modern and clean that the profiled openings of the nearby Plaza. 22 CPS is rich with details that both embed the building in its historic contrast and set it apart as an example of modern luxury. The tallest building in Long Island City, Skyline Tower will rise 67 stories. The 800 condominium units will have unparalleled 360 degree views of Manhattan and the surrounding skyline. This all glass curtainwall building is a sleek, monolithic structure with re-entrant corners articulating the form and creating a place for balconies. The designers used two shades of glass, a neutral blue on the broader faces of the building and a clear green on the edges. The result is a building that appears to expose its special interiors beyond its glassy exterior. The base and crown are screened with metal fins that add lightness and conceal parking at the base. This language of metal fins allows the private residential entry and the public MTA entry at the building base to both relate to each other and be separate. The building features a double-height sky-lit amenity space with a mezzanine lounge overlooking a pool on the 3rd floor. On the 5th floor amenities overlook an exterior terrace. A fitness center, sauna, spa, yoga room, parking, and storage round out the luxury experience. Originally built in 1950 as the headquarters for Look Magazine this landmarked building is known for its minimalist aesthetic and ribbon windows. Hill West redesigned the Look Building’s lobby, entry canopy and the commercial base through careful interpretation, rather than restoration of the historic original which has been altered in renovations of the 1990’s. Taking inspiration from the streamlined Art Moderne aesthetic, the designers created a canopy and numerals that look as though they have been with the building since it was designed in the 1950s with the freshness of present day. The lobby interiors were updated and are lined with veined marble that feels both historic and timeless. The designers looked to the spacing on the mullions above the base and carried down metal bullnose mullions to tie the commercial base to the rest of the building. The retail base looks both fresh and historically appropriate with contemporary details such as frosted glass behind the retail signage. Hill West rose to the challenge and created a modern renovation that captures the essence and spirit of the historic building. One Riverside Park at 50 Riverside Boulevard is a 33-story, 274-unit, residential condominium that is part of the exciting developments on Riverside South that include both Riverside Center and Waterline Square. The building’s design turns to a lighter, glassier aesthetic than that of the developments to the north. The design was achieved by an innovative use of the SOTA wall system, which is a hybrid of curtain wall and window wall. Both stone and glass panels are part of the architectural precast system used in the composition to create the facade. The storefront is framed in 4 textures of stone and the building is glassier as it rises to capture the Hudson River, Riverside Park South, and Manhattan views. The residential entry is dramatically elegant with a series of canopies on double-height window openings. The building is segmented to include many different levels of high-end residences that include full floor apartments and extensive amenities: a screening room, game room, lounge and 24-hour fitness center. Some units feature private swimming pools. One Riverside Park distinguishes itself and while still becoming an integral part of the Westside’s ongoing transformation into a premiere destination. To the south, Riverside Center and Waterline Square will feature 3.2 acres of open space and a K-8 public school with over 100,000 square feet of retail shops and services. Tower 28 in Long Island City was designed to be a 57-story residential rental tower inclusive of a luxury amenity experience to rival any vacation destination. The building is comprised of two connected segments; the tower on 28th Street houses all of the 451 residential units, while the smaller building on 27th Street houses amenities including a pool, a fitness center, spa, sauna and yoga studio. The two segments are connected on the 2nd floor by a covered breezeway and share a roof deck that can be opened in summer months via a Nanawall to the pool in the amenity building. The tower’s mass is broken into lighter volumes to create a slender volumetric expression. A combination of spandrel glass and fritted glass panels in a variety of different colors and patterns, are layered to create compositions that move up the building in shifting, dynamic movements. The observation deck on the 60th floor of the building allows residents to take in the incredible views. 1 Flatbush Avenue, a 19-story, 183-unit rental building, sits at a busy intersection in Brooklyn on a wedge-like site. This corner site called for a contextual building with a large, three story, double-height retail base. Hill West created a masonry building with glass structures pushing out as they rise above the base. Referencing industrial language, columns rise from the storefront to the third story where a setback allows for a recessed amenity terrace. The residential entrance is on Fulton Street with convenient nearby subway access. A two story vestibule with a grand chandelier is set apart from the retail entrances by a bronze marquis. Some units have private terraces and all residents enjoy the rooftop amenity terrace with BBQs, a shuffleboard court and views of the Manhattan Bridge to the South. The terrace parapets were designed with a view gap specifically to allow enjoyment of the views at the 3rd floor and rooftop. The Seymour is a brick 12-story, 67-unit residential condominium in Chelsea inspired by the many industrial buildings in the neighborhood. Detailed custom brick work was used to add a layer of richness to the industrial language. A soldier course of brick defines oversized window bays that span two floors to create floor-to-ceiling mullioned windows in the residences. Deco trim in black metal at the entry and at the windows on the first and second floors define the base of the building with custom details. There are several floor-through units, several units that have private terraces with both front and rear views, and a ninth floor penthouse level. This building boasts the luxury details that have made it a neighborhood favorite. The D’Orsay is a jewel-like, intimate 11-story, 21-unit condominium building located at the crossroads of the West Village, the Meatpacking District, the Highline, and Chelsea. Hill West poured attention into each detail of the fine brickwork of the façade and intricate glass and metal work. A mixture of classic ornament and industrial touches allow this design to walk the line between edgy and highly sophisticated. The designers worked with elegant round patterns in the metalwork at the entry doors and more industrial elements at the residence windows, such as the horizontal mullions inspired by warehouse-like expanses of glass. This mixed palette befits the varied neighborhood. Building amenities include a rooftop garden, a spa with a plunging pool, steam and treatment rooms, a fitness center and a drawing room. The residences range from 1 to 4 bedrooms and are designed with direct elevator access. Many have private terraces and all are fitted with the luxurious residential details that Hill West is known for. Hill West is proud to collaborate with some of the world’s most renowned designers. At 56 Leonard we worked closely with Herzog & De Meuron to enable the realization of their iconic vision. This 60-story residential condominium tower is one of the most recognized New York City residential designs of all time. With 145 residences, volumes that cantilever from its core, and a famous sculpture wedged on the ground floor entry by Anish Kapoor, the level of detail required by the designers called for the finest technical knowledge mixed with a highly sensitive respect for the design. Each of the two-to-five bedroom residences has outdoor space and incredible views. Hill West collaborated with KPF at 111 Murray to design one of the most distinctly shaped, new skyscrapers of the Financial District’s skyline. This 64-story condominium tower expands as it rises toward its crown, wrapping its form in glass and culminating in a reveal that leaves the top of this building sculpturally distinct. The complex form, along with many distinct details, required the collaboration of a multitude of talented consultants, engineers and experts in their fields. The results are evident in such details as the canopy, the softly curved entrance, and the interplay of rich materials: anodized steel walls, custom hand blown glass, and travertine in the building’s lobby. Hill West is proud to be a part of the technical and design expertise that makes possible a residential experience as fine as 111 Murray. LANA Hotel and Residences at 515 9th Avenue is 12-story mixed-use hospitality/residential building that contains 108 residential units and a 90-key hotel. Hill West created this unique building with a shared fitness facility and separate residential amenities that include rooftop terraces. The concept behind LANA was to create an intimate hotel with edgy amenities and to pair it with a boutique residence. The white paneled exterior with playful fenestration patterns has numerous terrace spaces that evoke a sense of Miami in the heart of Hell’s Kitchen. Originally completed in 1930, this 72-story landmarked Art Deco building in New York City’s Financial District was falling into disrepair when Hill West was called upon to refurbish over one million square feet of office space. Full floors range from 6,000 to 15,000 to 38,000 square feet. Exterior brick and limestone needed cleaning, repointing and repair, and the heating, ventilating and AC systems needed improvement. The lobby was renovated with Italian marble and bronze and each level was once again rendered fit to be called “The Crown Jewel of Wall Street” as it had once been known. The Trump Building was declared a landmark in 1998 and boasts beautiful bronze doors with a sculpture of Oceanus over the entry and a famed 2 story marble banking hall with mural by Ezra Winter of Rockefeller Center fame. One of the first buildings to be completed as a part of the Riverside Center masterplan, Hill West collaborated with Pelli Clarke Pelli on the 42- story One West End Avenue. This condominium tower has 246 units and 12,000 square feet of landscaped outdoor space. Waterline Square comprises of 3 buildings on the Hudson River waterfront of Manhattan’s Upper West side between West 59th Street and West 61St Street. The buildings are connected by a Matthew-Nielson designed park complete with a water feature and will include over 100,000 square feet of leisure, lifestyle and sport amenities. Hill West collaborated with Richard Meier & Partners on One Waterline Square, Kohn Petersen Fox Associates on Two Waterline Square and Raphael Vinoly Architects on Three Waterline Square. The original ULURP for Riverside Center, approved by the City Council in 2010 included 5 buildings, and was designed through a collaboration of Hill West with French Architect, Christian de Portzamparc. Waterline Square picks up where the ULURP left off and is connected to the other 2 buildings that were originally part of this ULURP by a footpath. At the Silver Towers, the 58-story pair of towers include 1,252 rental units located at the bustling intersection of West 42nd Street and 11th Avenue in the heart of Midtown Manhattan with close proximity to Hudson Yards. The buildings contain over one million square feet. The site plan was carefully considered to maximize views, sunlight and elegance. The two slender towers that result are connected by a low-rise ring surround courtyard that serves as a private entry to the buildings. L. Stephen Hill collaborated with Historic Preservationists, landscape architects, interior designers and developer El Ad Group to give The Plaza Hotel, at the corner of Fifth Avenue at Central Park South, a stunning renovation that included converting portions of the hotel into 282 ultra-luxurious residential condominiums. A separate residential lobby was carved out of the ground floor that also includes a new hotel lobby, bar, and retail spaces. Luxurious new hotel accommodations and amenities gave this historic hotel an update worthy of its world-renowned status. Working with our affiliated interiors firm, Whitehall, Hill West created a new entry canopy and lobby for this corporate office tower. The lobby was transformed into a 16 foot, grand space clad in honed and textured limestone. The new reception desk, wrapped in polished marble and onyx mosaic sits in a central location accentuated by a strategically dropped ceiling. Cove lighting and warm hand applied Venetian plaster finish add warmth to this serene space that is classic, clean and fresh all at once. At 10 Madison Square West, Hill West converted a former toy building into a 23-story building containing 175 of the most coveted residential condominiums in NoMad. The now fashionable neighborhood north of Madison Square Park, was a former industrial zone that has become a thriving destination for restaurants, culture and art installations. The Toy Building was one of two buildings that made up the International Toy Center, a hub for the nation’s toy manufacturers and distributors. As with any adaptive re-use project, the designers had to devise ways to make an existing building, in this case made for toy distributors, become an ideal space for living. The building was a U-shaped, 16-story brick building with oversize windows on Broadway overlooking the park. The design team carefully removed one leg of the U- shape, allowing for light and air to flood the new residences and for the creation of a lush green roof courtyard at the 2nd floor that provides residents with a serene escape from city life. The existing building’s shell and structure were maintained but the interiors were gutted. New windows were designed for the large masonry openings with mullions designed to break down the scale and make the transition to residence while still maintaining the industrial appeal. Above the 17th floor, a new addition, clad in white limestone, is set back to create wrap-around terraces with unrivaled view of the city beyond. At the base of the building, the first 3 floors received new limestone cladding that complements the existing brick, ties the building base to the new addition, and lends elegance to the building’s street presence. Retail spaces enliven the neighborhood at the street level and a new canopy marks the private residential entrance to complete the building’s transformation from factory to luxury residential experience. Chelsea 29 will be a 21-story, 95-unit residential rental building with both retail and parking at West 29th Street, west of 7th Avenue. The building’s form is an updated take on the setback, “wedding cake” aesthetic of the pre-war commercial high-rises that line the blocks of the Garment District. The façade has an elegant vertical emphasis and is organized into three bays of windows separated by vertical limestone piers that start at the base and rise to the top through a series of setbacks and terraces. Each pier is capped by a decorative T-shaped metal finial in a dark metal finish. A series of thinner mullions clad in a matching metal rise between the limestone piers to create each of the three window bays. Dark metal grills and limestone bars make up the spandrels between the windows. A series of setbacks between the 13th and 16th floors create landscaped terraces fronted by glass balustrades. The building meets the street with two lower floors that embrace an aesthetic of polished and textured metal surfaces along with glass. The entrance sits underneath a glass canopy suspended by two steel rods and surrounded by metal mesh. The resulting composition is not an imitation of the past, but rather a modern reinterpretation of the district’s historic spirit that recalls a time when commercial high-rises shared their urban space with light manufacturing facilities. Hill West has developed a Masterplan for Parkhill City to bring several new buildings with nearly 500,000 square feet of residential development to the full block at 150-13 89th Avenue in Jamaica Queens, just north of Rufus King Park. The block was formerly home to Mary Immaculate Hospital, which closed in 2009. Two main structures of the hospital will be completely rebuilt into a new 16-story residential rental building with 339 units, enlarging the building and replacing its façade with a contemporary metal and glass skin. The adjacent building, which was the original prewar building, will have its limestone and brick façade restored. Another structure, a 4-story historic building, will be converted to townhouses. The buildings are currently under construction. The City Council approved the Riverside Center ULURP in 2010. Hill West collaborated with French Architect, Christian de Portzamparc, to develop 5 new multi-use buildings overlooking the waterfront in New York’s Upper West side between West 59th and West 61st Street. This project has evolved to include 3.2 acres of open space, a K-8 public school, and now has 100,000 square feet of retail shops and services. Three of the buildings have been branded as Waterline Square, developed by GID Development Group and the remaining 2 buildings are currently under construction with separate developers. Hill West has collaborated with world-renowned architects on 4 of the 5 buildings including the three buildings at Waterline Square and One West End in collaboration with Pelli Clarke Pelli Architects. This 33 story luxury mixed-use tower is part of a four building development on the western edge of Fort Greene in Brooklyn. Just under 400 feet tall, comprising 478,000 square feet in area and containing 440 apartments, 86 Fleet Place will be the tallest and largest building in the development. Hill West crafted a design noted for its curved, cylindrical crown and delicately placed glass balconies. 86 Fleet Place, with its distinct form, certainly makes a mark among the emerging skyline of Fort Greene and Downtown Brooklyn and will include 11,000 square feet of retail space, outdoor dining, a 3 level parking garage, a well-appointed fitness facility, a 7,600 square foot landscaped community terrace and a penthouse terrace with Manhattan and river views. Rather than creating a building with the intention of melding it into its surroundings, the South Bronx Master Plan gave Hill West Architects a unique opportunity to create an entire neighborhood, two projects that are linked by the waterway and are on either side of the 3rd Avenue Bridge which connects the Bronx to Manhattan. Well serviced by subway access, this up and coming neighborhood is rich with culture and local flavor. Hill West’s new Master Plan for developers Somerset Partners and Chetrit will bring new commercial, retail, culture, and residential development to the area, along with a new park along the waterfront that will add new ways for the residents to connect to the waterfront. The Aldyn at 60 Riverside Boulevard is a 39-story condominium tower with 286 units overlooking the Hudson River on Manhattan’s Upper West side. Hill West crafted residences worthy of the spectacular unobstructed river views. Amenities include La Palestra Athletic Club and Spa that includes a 75-foot indoor pool, hot tub, rock-climbing wall, basketball and squash courts, and a bowling alley. 3514 Surf Avenue is a 21-story, 425-unit, market-rate apartment building that brings “Miami sophistication” to the Coney Island Boardwalk. Located outside of the gated communities in the surrounding neighborhood, 3514 Surf Avenue enhances the area with a large retail space set to house a quality neighborhood food store, improves the boardwalk and street ends, and ushers in a rebirth to the area. The beach and boardwalk informed the placement of the structural elements and the program of the building’s foundation. The heavier two towers were shifted back toward Surf Avenue while the lighter garage structure was moved towards the beach to mitigate erosion and depths of excavation required for the foundation. 3514 Surf Avenue’s garage location presented a challenge, but ultimately allowed our design team to develop a creative and effective solution. Our team cladded the garage with the goal of creating a landmark while providing a playful, 3-dimensional façade appropriate for the boardwalk and beachfront. The design team and landscape architect collaborated on a design that serves the community with a public space for food, activity centers, shade, seating, and lush plantings allowing the building and boardwalk to become a destination in the neighborhood. As the first market-rate building in the area in two decades, 3514 Surf Avenue is a renaissance in the community of Coney Island.